With so many wineries in Stellenbosch it can be difficult to choose which ones to visit, so the natural course of action is to visit as many as possible. Nobody wants to be designated driver though, and they're too far apart to walk between, so what options are there? A full day cycling tour with Bikes 'n Wines of course! I love cycling and I love wine so I was particularly excited about this experience, so excited in fact, I ended up arriving half an hour early for the tour at Asara Wine Estate & Hotel - not a bad place to hang out for thirty minutes. The tour guide, Innocent, was ready and waiting to greet me and the rest of the group with indemnity forms and an explanation of what to expect from the day. The tour started at 10am and finished around 4pm, so we had a lot to pack in! Once we'd been fitted with helmets and shown how the gears on the bikes worked, we set off along the rocky vineyard paths. Despite not having done any exercise for the last month, I was confident the promise of wine and breath-taking views would be enough to spur me on up those steep valley hillsides (and this was true for the first half of the tour, towards the end of the day I started to flag a bit), thankfully the pace of the tour was very gentle and punctuated with stops to appreciate the scenery and learn about the local winemaking. The first winery we came to was Neethlingshof Wine Estate, established in 1692. In the shade of a large oak tree Innocent talked us through the immensely fascinating history of wine production in South Africa, and how the various cultures who colonised the Cape were integral to what we recognise as South African wine today. Sitting out on the patio we were each poured a glass of Gewürztraminer, Merlot, and Caracal Red Blend accompanied by a chocolate truffle carefully paired with each wine. A real treat for the senses! The onward bike trail was slightly steeper through the vineyards, so we were somewhat relieved to reach the edge of the farm and continue on a paved road. Since it was the first day of March the red grape harvest had officially begun, and we got to watch both machine harvesters and hand-pickers going about their business, a great sight from our unique vantage point. A few kilometres down the road was our next stop, De Waal Wines, an estate now into its 9th generation of winemakers from a single family - dating back to 1864! De Waal specialises in red wine so we had a choice between tasting one white and four reds, or two whites and three reds. Since most of us on the tour were white wine fans we went for the latter option, starting with a Sauvignon Blanc from their Young Vines range and a refreshing Chenin Blanc - always my favourite. Up next were two varieties of the famous Pinotage, a uniquely South African blend of Pinot Noir and Cinsault invented by Abraham Izak Perold at Stellenbosch University. The final tasting was a Cabernet Sauvignon 2016, after which we spent a while quizzing the sommelier on the history of the wine estate, the De Waal family, and the commercial wine industry. Back on the road we struggled up a steep hillside that seemed to go on forever, only to be rewarded with the most incredible views of the valley stretched out below. You know what they say, what goes up, must come down... In about ten seconds flat we were back on level ground, making the uphill battles all worth it! The midday sun was beating down at this point so we were overly grateful to arrive at the third stop; Lovane Boutique Wine Estate (and not just because this stop included food). Waiting on the table for us were two cheese platters with crackers, cured meats and fresh fruit, plus a glass of chilled Sauvignon Blanc to start, followed by the Isikhati Red Blend, the 2016 Cabernet Sauvignon, and a special taste of their Port style wine. Not to everyones taste, but I thoroughly enjoyed it! We just had time for a quick meander round the Lovane cellar before commencing the last stage of the tour; a scenic cycle back to Asara for the fourth and final wine tasting. Perhaps saving the best till last, we took a seat in the impressive tasting room that overlooks the barrel room - although it's really more of a barrel warehouse. With crackers to cleanse our palate, we started with the first sparkling wine of the tour, a Method Cap Classique, always a winner! This was followed by our first rosé of the tour, and finished with a Cape Fusion 2015 red blend - plus we got to watch some visitors grape-stomping in the barrel room, the harvest season is truly in full swing! 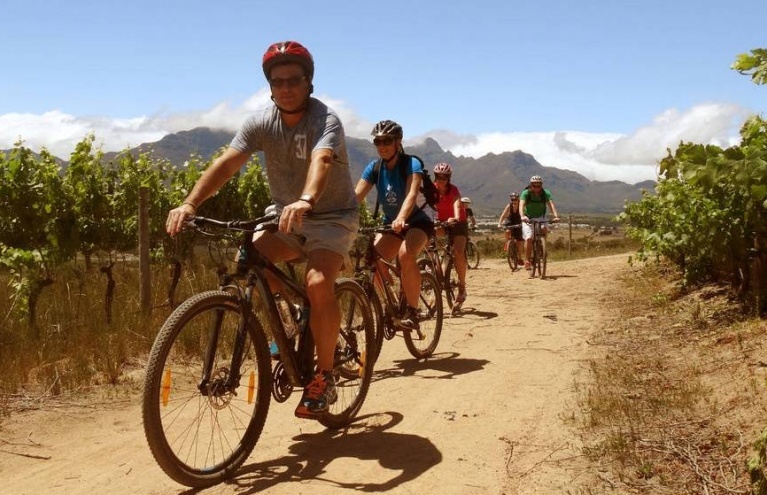 All in all the Platinum Stellenbosch Bike Tour & Wine Tasting experience is great fun, and combines fantastic scenery, exceptional wine, and detailed commentary with a healthy dose of exercise! I'd recommend this tour to anyone with an interest in the history of Stellenbosch wine production and those who want to experience the best of the region with an expert guide at the helm. Huge thanks to Innocent for being an entertaining and knowledgeable tour guide, and to Bikes 'n Wines for inviting me along! Head to Stellenbosch and spend a blissful day biking through the Winelands, stopping for three wine tastings along the way!